вот решил создать такую тему. мы постоянно спорим, кто лучше для Робби - Чемберс, Даффи или сам Робби может со всем справиться. но безусловно в последнее время слово "продюсер" очень многое играет в жизни звёзд. и вот, похоже, у Робби появился возможно не человек, который поможет ему писать великие хиты, но который при наличии хороших песен сможет их вывести в люди. безусловно, песни Робби всегда на слуху и без этого были бы, но тем не менее. Ронсон ведь молодой парень, но уже уважение себе завоевал большое. Несомненно его альбом с кавер-версиями Version берётся и будет браться на расхват. Не забываем, что уже и с Робби он помог с 5 песнями в общей сложности. сейчас они вместе в работе над новым альбом Робби. а вот предлагаю почитать интервью с ним о Робби и не только. This week sees the release of Mark Ronsons new album 'Version' which features Rob singing a cover of 'The Only One I know' by The Charltans. I was lucky enough to catch up with Mark and chat with him about his new album and about the work he has done with Rob to date. Read on to hear all about how 'Lovelight' is one of Mark's all time favourite tracks he has worked on, and how recording the french lyrics on 'King of Bongo' took a while! Hi Mark and many thanks for taking the time to answer some questions for PureRobbie.com. I appreciate that you must be a very busy person and time is precious! Firstly, I’d love to learn a bit more about how ‘Mark Ronson - Superstar DJ’ came to be. At what point did you decide that music was going to play such a major part in your life and that being a DJ and later a producer was going to become your career? I was always into music since I can remember. I used to play drums and violin from the time I was five. Then I focused on the guitar in my early teens and put a band together. I loved playing out, recording in the studio, writing music....all of it. When I was 16, I got really into hip-hop and decided to try DJ'ing. I spent all my free time in my room practicing, coming up with mixes, blends and things. I started dj'ing alot in the downtown New York club scene and that led me to producing. I think the first single I ever bought was by the eurovision song contest winner by 'Bucks Fizz'. I had a little Sony "my first record player" that my Dad got me. Who are your Musical heros and why? I have so many. I think the pinnacles are David Bowie, Stevie Wonder, The Beastie Boys, Bob Dylan and James Brown. As far as producers go, i've always looked up to Rick Rubin, Quincy Jones, DJ Premier, and the Bomb Squad. And for DJ's, my heroes are Red Alert, Kid Capri and Grandmaster Flash. Recently I heard the mini mix that you had worked on for Annie Mac’s Radio 1 show, and really enjoyed it. Where does your inspiration come from, and what else influences your work? I grew up listening to so many different kinds of music. My Dad played alot of classic funk and soul when I was growing up. And as a teen, I worshipped both hip-hop and British guitar bands like Blur, Radiohead and The Wonder Stuff. And then the classics like Zepellin and The Beatles. And that's why my DJ sets/mixes are so diverse, I don't really like being pigeon-holed to one genre. 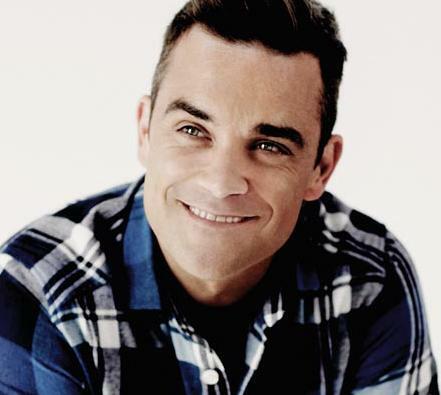 When was the first time you heard of Robbie Williams? After I moved to New York, I would come back twice a year to visit my Dad and my family in the UK. I remember hearing "Back for Good" and thinking "that's a really good song". Then a few years later in New York, I remember seeing the video for "Millenium" and being blown away by it, the way it mixed this great melody with a hip-hop beat and swirling James Bond strings. How did you first meet him and how did the collaboration come about? when I was working on my first album about five years ago, I wanted to get Rob on a track. I was in LA and I went to his house. We talked about music for a while and I played him some tracks in my car. We were both into the idea of working but because of his schedule, it never worked out. Then, I got a call about a year ago that he was working on a new album so I drove my car all the way up to his house on the top of the hill and we listened to music again. I love working with him. We have very similar tastes and sensibilities in music. Everything from Ryan Adams album cuts to Scarface's Texas hip-hop. Can you tell us a bit about the creative process of each the tracks you worked on from ‘Rudebox’? Firstly Lovelight - Rob played me that song and said he'd like to cover it. I was intimidated at first as the original was quite beautiful, soulful and complex at the same time. I started with a drum beat and some electric piano - just enough reference for him to lay down the main vocal. Then, I added the horns and it turned out that The Brand New Heavies (one of the first groups to turn me on to funk when i was a teenager) were recording next door. They loved the track, and Andrew Levy ended up playing bass on the tune and N'Dea Davenport did all the female vocals. It was a bit of a dream come true for me. "Lovelight" is by far one of my favourites of any song I've worked on. King of Bongo - Another cover that Rob approached me with. I loved the original and was trying to figure out how to put a new spin on it. So added an electro-y drum beat. I love Rob's vocal delivery on it, it's like Tom Waits meets Shaun Ryder. Although recording all the French at the end did take a while. A few weeks later, I was working on Lily's record (who was still an unknown) and I asked her "hey, do you want to sing on a Robbie Williams tune?" and she was like, "yeah, sure". I love her voice, especially the way she mutilates the phrase, "je ne t'aime pluuuuussss mon amour". It reminds me of the old Billl Wyman track "je suis un rock star". Keep On - This was a demo lying around from the last album. Rob played it for me and I loved the song. My friend Michael played all these beautiful guitar lines on it too. And the fake strings don't even sound that bad. Good Doctor - I sampled a Jamaican reggae song that we found out was impossible to get permission for. So I had to change the whole beat two days before the record was due. I think Rob's background ad-libs are as funny as the verses. One must listen closely though. What is your opinion of how ‘Rudebox’ was received? I guess anytime someone does something vastly different, they're bound to get some flack for it. I've never played "Lovelight" or "Bongo" for anyone and not get a positive reaction. And I love "Burslem Normals" and a couple other tracks that Soul Mekanik did. So with your new album ‘Version’ out on the 16th April, this must be a very exciting time for you. From what we have heard and seen of it already, it is going to be a huge hit, with some great artists and classic tracks involved. How did the new album come about? I had done a cover of Radiohead's "Just" for a compilation and started messing around with some other tracks that I loved. Then, I added the horns and the vocals and pretty soon, I had the meat of an album. How did you manage to select 12 classic tracks from what must have been an endless list of potentials? I would just experiment with each song by bringing up a drumbeat and playing the chords. Songs like "Toxic" and "Oh my God" just instantly felt like they would work. Mainly, they were my favourite songs really. Rob is singing the amazing ‘The only one I know’ by The Charlatans. Was Rob given ‘The Charaltans’ or were ‘The Charlatans’ given Rob? That's one of my favourite songs from when I was a kid and The Charlatans grew up right near where Rob's from. Rob's the only one who could have done that song. So what next for Mark Ronson? I'm going to be touring a bit this summer. And I'm also producing a record for Daniel Merriweather--the kid who sings (brilliantly) on "Stop Me". You already has a pretty impressive list of artists that you have worked with to date, who else would you like to work with? Not really. I prefer working with the up-and-comers. What is your personal highlight from the last 12 months? Probably winning Producer of the Year at the Music Week Awards. Thank you so much again Mark. On behalf of all of the Staff and members at PureRobbie.com, I would like to wish you the very best with the new album and your future career. We all look forward to hearing much more of your fantastic work. Mark's new album Version is out now featuring the current single Stop Me which is currently at no.2 in the UK singles chart. Plus another 13 new tracks including Mark's unique take on songs from Kaiser Chiefs, Coldplay, Britney and more. 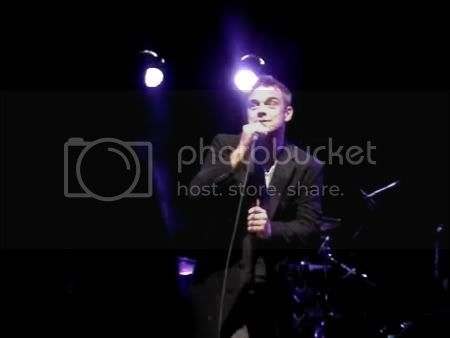 Guest vocals on the album include of Robbie Williams, Amy Winehouse, Kasabian and Lily Allen. 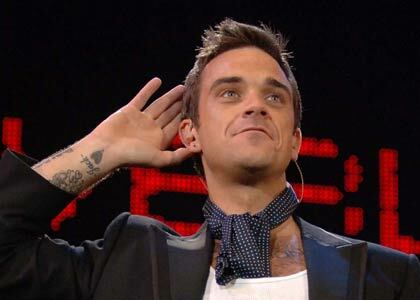 Producer Mark Ronson is not ashamed to have worked with Robbie Williams. Robbie's last album 'Rudebox' was a chart failure and critically panned, but the music producer is "proud" of the work he did on the LP. Mark said: "I don't want to disassociate myself from 'Rudebox' at all! I'm proud of the stuff I did on that record. "People were extra hard on him, they didn't like the first single and that seemed to taint the whole album." But Mark - who has also worked with Christina Aguilera and Amy Winehouse - is not interested in helping Britney with her pop comeback. He said: "I wouldn't really like to help with Britney's comeback. "She can sing but she sounds better over glossy, electronic pop. I don't think our sounds would marry. She can definitely reclaim her pop crown, though." У Марка вышел сингл (на самом деле месяц назад) Oh My God, на вокале Лили Аллен. На альбоме что-то эту песню не приметил, а вот сейчас заразился. 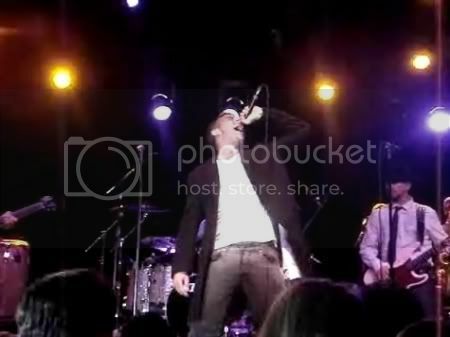 Mark Ronson at the El Rey Theater in Los Angeles, Wednesday October 3, 2007, featuring Robbie Williams performing "The Only One I Know"
The producer and solo artist celebrates the release of his second solo album with the help of some friends at the El Rey. "I feel like I'm 75, and it's 'This Is Your Life,' and they're wheelin' out people from my childhood," Mark Ronson said a few songs into his gala performance Wednesday at the El Rey. He was marveling a bit too intensely at the parade of talented but obscure vocalists who'd taken the microphone so far, during his first Los Angeles show with a band. But Ronson knows how to place a zinger for the most impact. Just then Robbie Williams strode onstage, and the DJ-producer turned solo artist's hyperbole became justifiable. Williams, one of England's biggest pop stars, elicited the "oohs" and "aahs" Ronson wanted as he celebrated the release of "Version," his second solo album, a collection of reworked English chart hits. 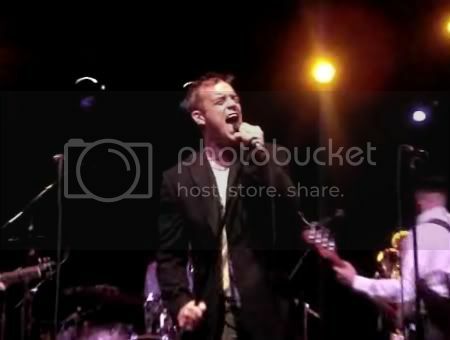 The dapper but somewhat subtle 32-year-old bandleader stood to the side playing guitar as Williams, a world-class ham, shadow-boxed through the Charlatans' song "The Only One I Know." Then he was gone, returning the spotlight to his once and future producer. The moment defined what makes a producer important these days: not just ears gifted enough to create a signature sound, but the party-throwing skills of Hugh Hefner. Ronson, who recently entered the league in which big hitters such as Timbaland play, is expert at coaxing interesting talent and enhancing their gifts within well-appointed musical environments. Ronson was born in London but grew up mostly in New York, and his sound traces the transatlantic journey of soul and hip-hop. It may seem easy to peg, but his perfectly tailored adjustments of that erudite sound for each client make him beloved. His productions for Amy Winehouse and Lily Allen both sparkled with rhinestone retro ornamentation, but the former is full of teary girl-group memories, while the latter borrows the streetwise bounce of vintage reggae and ska. "Version," which provided the material for this set, is a calling card and a sneak preview. Most of the vocalists who joined him at the El Rey, including D.C.-based rapper Wale, Philadelphia-bred vocalist Santogold, big-throated Londoner Tawiah and Australian emergent heartthrob Daniel Merriweather, have Ronson-helmed projects in the works. Their turns Wednesday were meant to show off particular skills -- Wale's metrical approach to rhyming, Merriweather's breathy croon -- that might stick in audience member's minds. Ronson was happy to stand back and let his protégés shine as they reinterpreted music by celebrated acts including the Smiths and the Jam. Some guests had already done enough shining to let themselves simply enjoy Ronson's fete. Alex Greenwald of L.A. band Phantom Planet sang like a rock star and gleefully stage-dove. Ethiopian American singer Kenna turned the Ryan Adams song "Amy" into psychedelic soul. Nikka Costa, returning a favor to her old producer, wowed with a Tina Turner-style cameo. Behind these stellar throats, Ronson's band revved up his loose arrangements and kept the capacity crowd doing the frug. The Haggis Horns (England's equivalent to the better-known Daptones) kept the sound bright, and former Jamiroquai bassist Stu Zender kept it funky. Ronson himself contributed on various instruments, but mostly he was the ultimate anchorman, lending continuity to a rapid-fire event. This was Ronson's life, after all, unfolding in sound. And it's clearly only the beginning. А он, оказывается, совсем недавно, буквально неделю назад, в Москве был... круто. ура!!! Марк выиграл Brit Awards! Молю Бога, чтобы Робби перестал сотрудничать с ним. В свою очередь брат Лайама Ноэль Галлахер обрушился с критикой на успешного продюсера и диджея Марка Ронсона, ставшего известным благодаря кавер-версиям известных хитов. Гитарист Oasis посоветовал продюсеру Эми Уайнхаус выучить три аккорда на гитаре, чтобы написать хотя бы одну собственную мелодию. Ронсон не оставил это замечание без ответа. В своем блоге он объявил, что берет уроки игры на гитаре у Jay-Z и уже выучил оба аккорда одного из главных хитов Oasis - "Wonderwall"
я Ронсона тоже не люблю. как и Галлахеров, впрочем, но у них песни потрясающие. Оу, класс! Это новый сингл "сигаретного" Марка? Да, Сань, согласен, очень стильно, глаз радует. Совсем, не ново, но с отличным вкусом выполнено. Песня эта, кстати, мне пришлась (Банг-банг..) по душе. спасибо за сингл и миксы, завтра отслушаем. Крашеный Марк и тема велобайков раскрыта. Жмём на картинку там новое видео! согласен, Саш, по поводу 20010, да и вообще нулевые подарили очень мало достойного, по пальцем моей слесарской руки можно пересчитаить. А видео очень даже не дурное, всё в нём есть, и к мОлодежи поближе Марк всё подкатывает. Зачёт, однозначно.